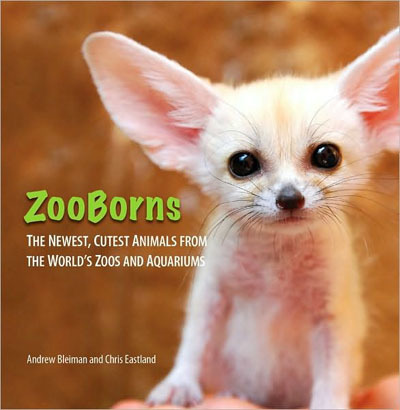 ZooBorns could be the cutest, nicest stocking stuffer for animal lovers this year. Ten percent of all revenue from sales goes directly to the Association of Zoos and Aquariums Conservation Endowment Fund. It’s affordable, and great for small hands to hold (though it’s not a children’s book in reading level). ZooBorns contains many adorable baby animal photos, including ocelot, Sumatran orangutan, swift fox, giraffe, sea otter, Gentoo penguin, red panda, banded mongoose, loggerhead sea turtle, red kangaroo, Bengal tiger, Beluga whale, Grevy’s zebra, crowned sifaka lemur, emperor tamarin, aye-aye, clouded leopard, Asian elephant, Columbia Basin pygmy rabbit, fennec fox (on cover) and many more! The book represents a collection of photos from zoos and aquariums around the world, including Monterey Bay Aquarium in California, Edmonton Valley Zoo in Canada, Taronga Zoo in Australia, Denver Zoo in Colorado, Musee de Besanco in France, Audubon Zoo in Louisiana and more. It’s not just a coffee table book or cute stocking stuffer. ZooBorns strives to help readers understand the link between these baby animals and the fight to keep some of the species alive in the wild. It’s no wonder I liked the book though. Seems I have a lot in common with one of the authors, Andrew Bleiman. In addition to being zoo and aquarium lovers, we’re both English majors who work in new media. The other author, Chris Eastland, is an artist, designer and photographer who lives in Brooklyn. My previous post on this book, Zoo Babies to Hug and Squeeze, explains the background of ZooBorns. 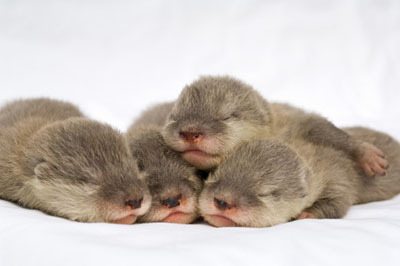 In case you haven’t been over to the site, you really should check out ZooBorns.com for a daily dose of animal-induced smiling. My only gripe with ZooBorns is that I can find no evidence it’s printed on sustainably sourced paper, which would be nice since the book focuses on conservation. That issue aside, the book is nearly 150 pages of interesting and sometimes extremely adorable baby animal photos, complete with other information like the animal’s given name, species conservation status, and animal habitat and behavior facts. My favorites include the endangered crowned sifaka whose mother couldn’t care for her. She held a stuffed teddy bear for comfort as zookeepers fed her! Less than 1,000 of these lemurs remain in the wild. Another jewel in the book is the Columbia Basin pygmy rabbits from the Oregon Zoo in Portland. I have visited the area, but never knew about the tiny rabbits that went extinct in the wild in the 1990s. Twenty-six of these rabbits were born at the Oregon Zoo in 2009! Disclosure: I received a complimentary review copy of ZooBorns.